The following instructions will teach you how to change your own watch battery. Depending on your watch style, you may need a few tools to change your watch case. It's helpful to have the right tools in order to keep your watch in good condition and prevent damage. The first step is to place watch in the case holder. Case Holders are used to hold the case tightly so you can unscrew the backings on the case. Next, clamp the watch in the case holding vise by opening the two halves of the block. 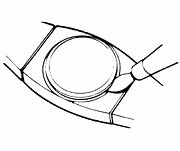 Place the watch in the middle and gently release or tighten the two halves, so that the clamps hold the watch firmly. 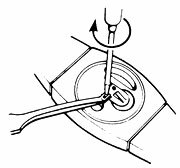 If the watch band does not unbuckle or unclasp, separate the band by pressing down with a pointed tool to remove the spring loaded pin that connects the band to the clasp or watch. A suitable knife will reduce the amount of wear and tear on your case backing. If you do not have a suitable knife to open your watch case, you can browse through our selection here. IMPORTANT: Before removing the battery, be sure to note which side is positive and which side is negative. You will have to put the new battery in exactly the same way. In some watches, the battery is held in by small metal clips. If so, carefully follow the directions below to remove the various types of clips. Use plastic tweezers to remove the battery. 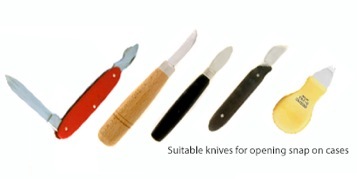 You can browse through Watch Material’s selection of plastic tweezers here. It is ideal to test the battery in order to ensure that the battery needs to be replaced. 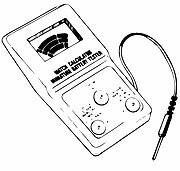 If you have a battery tester, now would be a good time to test the battery. Check your battery tester’s instructions for proper testing. If the watch has two batteries and only one tests "replace", replace both batteries. If both batteries test "good", then it is necessary to inspect the watch for other issues. Refer your local watchmaker. Read the number on the old battery and replace with the same or corresponding watch battery. Also, check the battery compartment for dirt and remove it. If you find corrosion, use a fiberglass pen to clean it. If the corrosion is extensive the watch will need to be cleaned by a professional. Be sure to test the new battery before installing. For tester setting, follow manufacturer’s instructions. Use plastic tweezers to install the new battery with the same side up as the one you replaced. Remember, the watch won’t work if the battery isn’t put in correctly. SPRING CLIP: Place one end of spring clip in place and firmly push the other end into its slot. Make sure the spring clip is in the slot to avoid bending spring clips. For screw-on clips: Place the clip over the new battery. Hold the screw with the fine point tweezers to press it into the hole. Tighten the screw. If there is a rubber sealing gasket in the back of the watch, make sure it is lined up properly before closing it back. Snap back cases are pressed either by hand or closed by a press. Locate the wrench slots on the back of the watch.Place the case wrench metal tips and match them with the notches on the watch back. 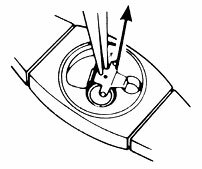 Next, turn the case wrench counter-clockwise to remove watch back. IMPORTANT:Before removing the battery, be sure to note which side is up. You will have to put the new battery in exactly the same way. In some watches, the battery is held in by small metal clips. If so, carefully follow the directions below for removing the various types of clips. Use plastic tweezers to remove the battery. Make sure the watch case back is lined up properly before closing. Start closing it by turning it clockwise with your fingers and tighten it with the case wrench. Reset the watch and make sure it is working. In analog watches without a second hand, observe the minute hand through a magnifying glass until you see movement to ensure that the battery is working.